Eighteen J/24s representing Hungary, Germany and Italy made the migration down to sail the gorgeous and enchanting stretch of sea between Porto Santo Stefano and the offshore islands of Giglio, Talamone and Giannella. If the weather and sailing are good or bad often doesn’t matter much to the J/24 sailors who love participating in Pasquavela; the seaside village is beautiful and quaint with many nice cafes and restaurants to enjoy any time of day! On the first day of Pasquavela, the winds were from the south/southeast with a nice, gentle 12-15 kts breeze. Establishing an early lead in the regatta was LA SUPERBA, winning two of the three races with BUDAPEST BANK taking the other race. The next day was characterized by adverse weather conditions, which was both widely expected and forecasted! Nevertheless, the excellent work of the Race Committee made it possible to carry out at least one race in the “scirocco” winds, blowing 20-25 kts at the start and gusting to 35 kts in heavy rain showers by the weather mark near shore (in fact, located just off the beach at Gianella!). After that experience, the PRO wisely sent the fleet home to lick their wounds and prepare for another day of sailing. 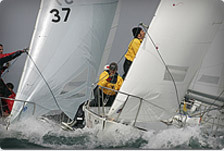 Unfortunately, Sunday’s sailing was also adversely affected by crazy weather! This time, lack of wind was the problem and sailors (happily) suffering from too much bright sun and flat seas. However, despite repeated attempts by the PRO to start a race, the wind simply would not cooperate, so no races were sailed on Easter Sunday. It was time to head back to shore and enjoy Easter Brunch with family and friends along the seaside cafes. Finally, Easter Monday was celebrated with three good races on a sunny day, decent breeze and flat water. A fitting end to a regatta punctuated by some wild weather conditions. Continuing on their performances in 2012 as both Italian and European J/24 Champions, the LA SUPERBA team led by Ignazio Bonanno (crew included Simone Scontrino, Francesco Linares, Alfredo Branciforte and Massimo Gherarducci) won five races to help them win by four points. Sailing faster and smarter all the time is the Hungarian team BUDAPEST BANK sailed by Farkas Litkey, their five 2nds and a first nearly pulled off a win were it not for the 4-2 on the last races. Instead, Farkas and the B-BANK boys took a well-deserved second overall with 11 net pts. Third was top German team JJ ONE from the Segel Club Joersfelder with a total of 26 net pts. Rounding out the top five were JAMAICA sailed by Pietro Diamanti in 4th and CAPTAIN NEMO skippered by Guido Guadagni in 5th. “Overall it was a wonderful Pasquavela– the total number of sailing teams is slightly lower than in 2012, but the quality is definitely increased,” commented YC Santo Stefano Commodore. “Pity about the weather (too windy Saturday, Sunday too little), but the race course off Porto Santo Stefano always presents an excellent challenge to all sailors. The race committee was excellent considering the weather! The behavior of the participants was wonderful and ‘Thanks’ to the Jury on the water. Please feel welcome, enjoy the awards, rivers of beer and pasta for everyone!” The German J/24 report on their experience at Pasquavela : “Three German teams sailed Pasquavela this year. The sailing could be characterized as ‘assault and demolition’ one race to ‘lulls and flat’ the next. At times it was sunny, then cloudy again, and finally we also enjoyed a bit of rain. After the months of snowfall in Germany, we were certainly happy to have a variety of weather. After all, there were temperatures up to 18 C! Plus, the Italians are always great hosts–pasta, beer, red wine! The races were sometimes very tricky and not every team did so well. The best German team were the guys from the JJ ONE who fought hard on the last day (getting a 7-2-4) to place third overall. Peter Langhans and his OSTE hoodlum boys occupied eleventh place and the ALICE girls (you know, all the pretty blonds) finished the series ranked 17th. Legendary German sailing coach, Thorsten Paech, appeared quite happy with the whole weekend. We practiced on the water in all kinds of situations. Pre-start, tons of mark roundings, and boat-for-boat tactics against the competition. I’m curious to see how our teams will implement their learning experiences in the next event?” Thanks for contribution from Paola Zanoni, Italiana di Classe J/24. 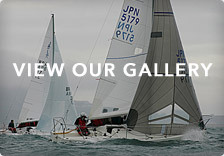 For more J/24 Italy Pasquavela sailing information, visit http://www.ycss.it/pasquavela.htm.